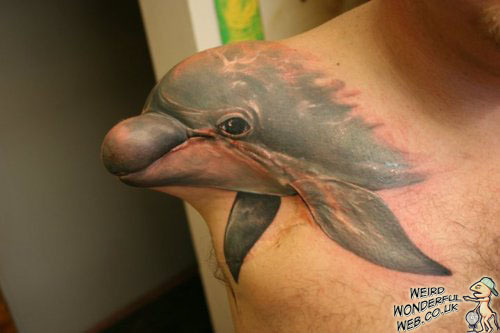 Weird Wonderful Web: Man replaces lost arm with dolphin tattoo! 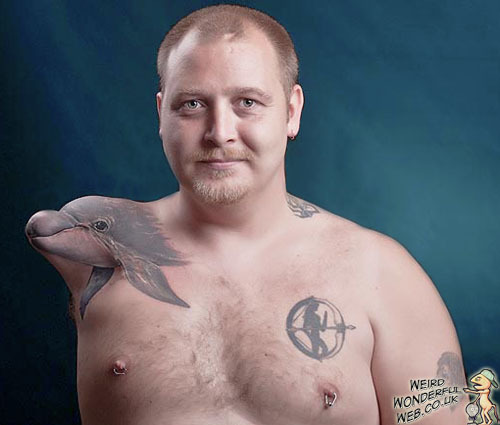 Norwegian Heine Braeck shows the dolphin tattoo on his stump where he lost an arm. Norwegian man Heine Braeck has had an amazing tattoo of a dolphin etched onto the remaining stump left after he lost his arm. "When I was 13 I tried to take a shortcut across the top of a stationary train which started moving, I lost my balance and grabbed hold of the wire that powers the train and got fried." "The first thing I saw after surgery was how much my arm was shaped like a dolphin's head, I finally decided to do something about it". And do something about it he did; he arranged to have the tattoo done by Bulgarian tattoo artist Valio Ska. RELATED POST: Shark attacked surfer's shark bite tattoo!